Found on an old hard drive. 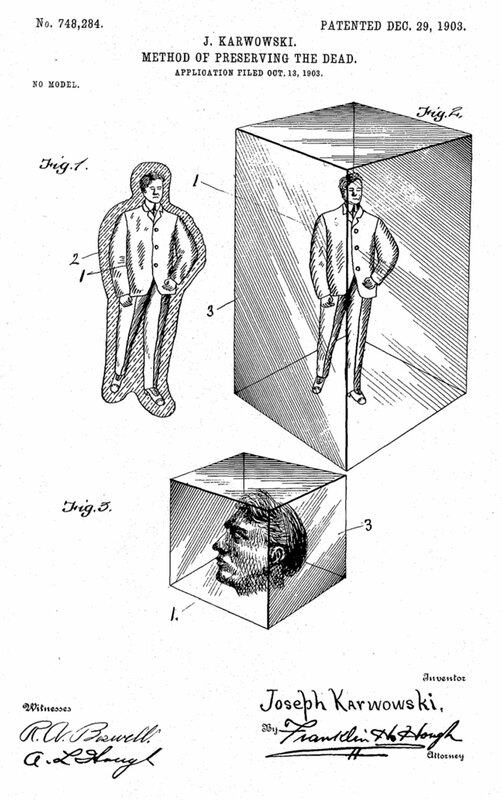 In 1903 a gentleman named Joseph Karwowski (“a subject of the Czar of Russia, residing at Herkimer”, New York) took out a patent on “certain new and useful Improvements in Methods of Preserving the Dead”, to wit encasing them in cubes of glass. 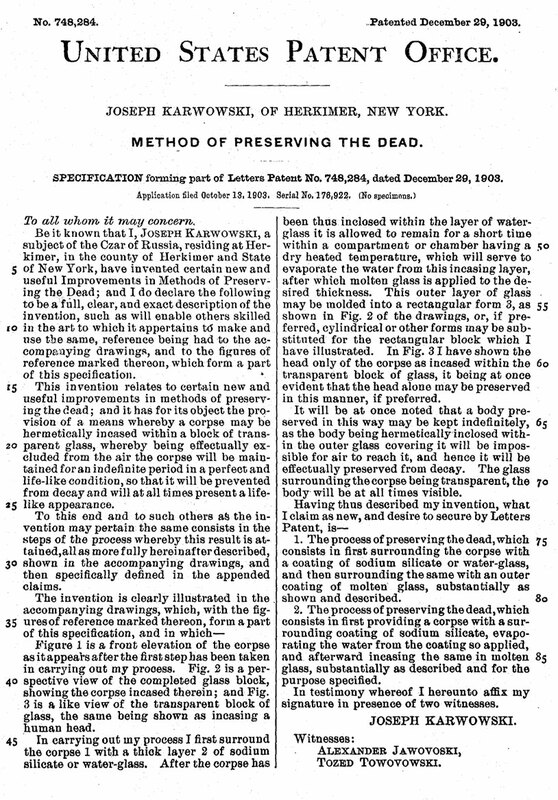 He claimed that excluding the air would preserve them “for an indefinite period in a perfect and life-like condition.” The process would involve encasing the body in a layer of sodium silicate which was dry heated to solidify it, then further surrounded by a cube or cylinder of molten glass. Evidently a man of thrifty instincts, he also allowed for the cheaper and less labour-intensive possibility of preserving just the head “if preferred”, Futurama style. Not that I or anybody else in their right mind is considering actually carrying out this operation, but I can see a number of potential snags here. I’m going to leave aside the notion that the chap illustrated above looks as if he was in the middle of objecting to being encased in sodium silicate when he was rudely cut off in his prime. Firstly, you’re “dry heating” a corpse in glass, then surrounding it with more, even hotter glass? Surely this means you’re cooking dear mad old uncle Joe sous-vide? Secondly, an eight foot tall cuboid of solid glass plus a dead body will be impractically heavy. What would you do with it? Leave it out in a cemetery, or put it in your living room? In the latter case, anybody who lived above the ground floor would be wise to go for the head only option, although even that would be rather hefty. Last but most disgusting, bodies don’t go moldy like bread, because spores land on them. They rot primarily from the inside, as autolysis causes the tissues to die and liquefy, while microbes that have lived harmlessly inside the body are let loose, unchecked by the living body’s defences. Some of these microbes are anaerobic, meaning that lack of contact with the air is not a problem. If you feel up to it, check out some of the Bronze Age people sacrificed and thrown into anaerobic, acidic bogs in Northern Europe. Or the bodies of dead Everest mountaineers and people in the Andes who were similarly mummified by cold, dry air. I warn you that searching for information or images on this subject can be quite upsetting, so the more squeamish reader should just take it from me that these people are quite well-preserved, but they’re not “life-like”. Nobody would be at all impressed if you had them in your house. This is probably an understatement. You should expect a Jodie Foster in Silence of the Lambs kind of reaction if you’re keeping dead people in glass cubes. I imagine the people at the patents office were relieved that they received “no specimens” of Karwowski’s method. It’s sad, though, that when Mr. Karwowski died he was probably buried or cremated like everybody else instead of being magnificently, vitreously entombed. For all eternity, the world’s heaviest paperweight.